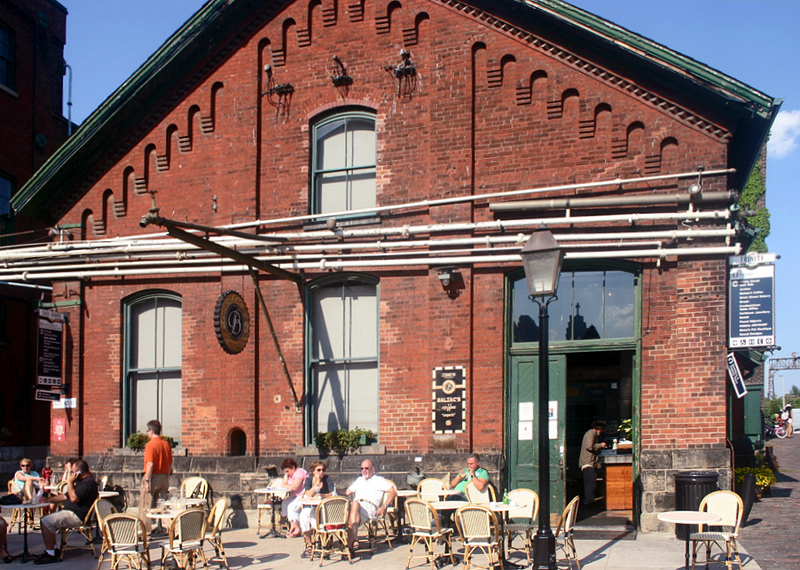 The Distillery District, a national historic site and one of Ontario’s most visited attractions, played an important role in the growth and wealth of both the city of Toronto and Canada as a whole. Most of the structures in this internationally acclaimed village of brick-lined streets and restored Victorian industrial buildings were designed by David Roberts, Sr. (1810-1881) and his son, David Roberts, Jr. (1845-1907). What’s now a busy tourist destination used to be one of the most prosperous industrial parts of Toronto. 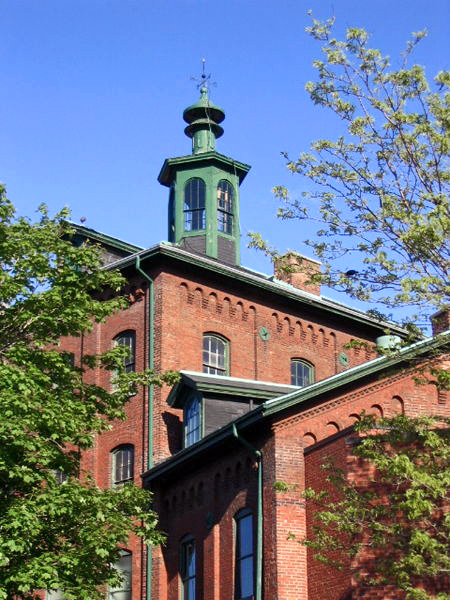 In fact, The Gooderham and Worts Distillery was the largest distillery in the world, producing over 2 million U.S. gallons of whiskey a year. The prosperous era of the distillery ended with the beginning of World War I, when the distillery converted its operations to manufacturing acetone. Nevertheless, thanks to the unique Victorian-era industrial architecture designed mostly by David Roberts, Sr. and David Roberts, Jr., this district remains one of the most important parts of Toronto. David Roberts, Sr. was an exceptionally talented civil engineer with a rich knowledge of architecture who emigrated from Ireland to the United States in 1842. Two years later, he settled in Toronto, and in 1945, his son and future partner was born. At that time, David Roberts, Sr. specialized in steam technology and engines. Before moving to the United States, he erected between thirty and forty mills in England and Ireland. His experience and knowledge didn’t go unnoticed, and soon he started to cooperate with William Gooderham and James G. Worts, well known Torontonian millers and distillers, who were about to expand their business by constructing a wharf and expanding their distillery. He continued to work with Gooderham and Worts, and in 1958, he was asked to come up with plans for the Great Stone Distillery. The architectural superintendence of the building, as well as the complete machinery contained within its walls, was entrusted to Mr. David Roberts, who during a period of nearly three years, from the first conception of the enterprise to its successful completion, gave the work a most assiduous and intelligent oversight. The establishment reflects the greatest credit upon his engineering abilities, and our city is fortunate in possessing among its professional men a gentleman competent for such an undertaking. The great success of the 300-by-80-foot Stone Distillery that cost $150,000 ensured new projects for Roberts, Sr. He started to work on the Maltings & Cooperage building complex, which was completely different from the Stone Distillery. It consisted of a three-storey malt house and kiln building, lower offices, a four-storey rectifying house, and an adjacent cooperage. In comparison with the Stone Distillery, there was a significant change in the design, style, and even materials used on this new building complex. Roberts worked with red-brick and decorative panel-and-pier construction instead of plain, thick limestone walls. 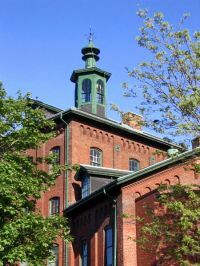 The red-brick cooperage building is located on the west side of Trinity Street and north of the Stone Distillery. It features a limestone base and Roberts’ typical arcaded corbeling brickwork. One of the most beautiful parts of the building is the elegant doorway to Building 32, apparently designed so that William Gooderham could enjoy this lovely view from his office. David Roberts, Sr. retired in the early 1860s but even then continued to influence the look of the Distillery, working as a consulting engineer on several projects. One of these was the reconstruction of the Stone Distillery after the great fire of 1869, in which he cooperated with his son, David Roberts, Jr.
David Roberts Jr. was born in 1845 and grew up in the Distillery neighbourhood. Just like his father, he was very talented, and he developed a lot of knowledge about architecture and construction from a very early age when watching his father. In 1864 and 1865, David Roberts, Jr. studied at Bryant and Stratton’s Mercantile College. 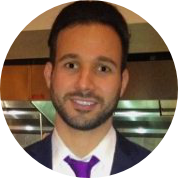 After his studies, he entered the Gundry & Langley architect office in Toronto. Afterwards, he worked in partnership with George Shaw, and from then on, he worked on his own. David Roberts Jr.’s first significant job was supervising the rebuilding of the Stone Distillery in 1869 after the great fire. At that time, his father was already retired and living on a farm in Elgin County, so young Roberts had the freedom to express himself. In 1873, Roberts, Jr. finished his first independent work, the Pure Spirit Complex. It’s located on the east side of Trinity Street and consists of seven buildings that are physically, functionally, and architecturally connected. The Pure Spirits buildings consisted largely of glass and wood that would have blown out to save the buildings. Primarily, the complex included a decorative cupola and only two of the four rooms facing Trinity street had a fourth story. Roberts, Jr. was in charge of numerous expansions of the Distillery during the 1880s. He designed and supervised the construction of the dozen rack and tank houses that quickly rose in the district. These mostly single-storey, redbrick buildings with elegant decorative brick corbeling formed the character and spirit of the Distillery. Ten of these buildings still remain, including buildings 42, 43, and 44 north of Mill Street and buildings 47, 48, 49, 50, 63, 64, and 65 to the east of Trinity Street. Special attention was payed to building 42, also known as “Rack House D,“ which is the largest Victorian storage building (six storeys high). Located at the northeast corner of Trinity and Mill Streets, Rack House D is also very popular for its architectural precision and symmetry. 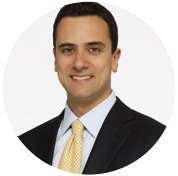 Thanks to his great projects, David Roberts, Jr. became Gooderham & Worts’ first corporate and personal architect. Besides constructing utilitarian buildings for Gooderham & Worts, he also worked on new corporate offices and residential buildings for families. In 1892, the corporate headquarters were moving from the distillery closer to the city centre, where Roberts, Jr. erected a new, stylish French Gothic office building five stories above Wellington & Front. 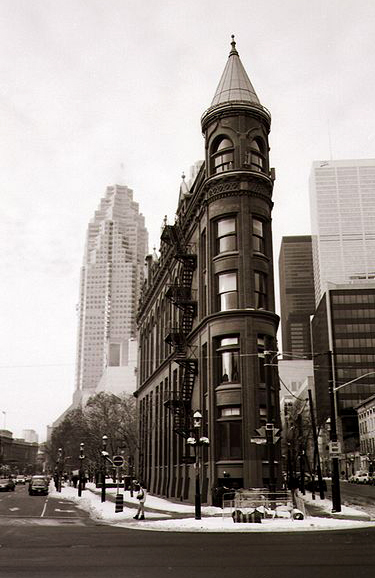 The construction of the Gooderham Building, also known as the Flatiron Building, cost $18,000. The main entrance is located on Wellington Street and is composed of elegant pinnacle dormers and arch frames with French Gothic styling. Rumours say that Gooderham’s office was located on the top floor of the building, where he could observe what was happening down at the distillery. It’s still used as an office building to this day. Other important works by David Roberts, Jr. were Gooderham’s luxurious new home in the Annex and his son’s residence on Jarvis Street. Both buildings were designed in the Romanesque Revival style. The home of young George Horace Gooderham at 504 Jarvis Street, built on lacrosse grounds, was a vital contribution to the sublime atmosphere of the street. This masterpiece is one of Roberts, Jr.‘s most significant works. The building has survived and maintained its beauty, so Torontonians can enjoy this monument even today. George Gooderham’s imposing mansion at Bloor and St. George is an exceptionally well designed architectural treasure with perfectly harmonious features. Without any doubt, it’s one of the most eminent Romanesque revival buildings in Toronto. It’s not just a perfect example of great architectural work, though: the Gooderham residence is an example of precise, excellent craftsmanship. Most notable buildings designed by David Roberts, Sr. and David Roberts, Jr.
Great article. I am interested in learning more on a building that Robert Jr. designed and I am wondering if you came across any information on it during your research. It is (or rather was) McConkey’s Restaurant built in 1880 (King Street West near Jordan Street, a commercial block erected for Alex Manning)? Any references would be greatly appreciated. Thanks. I thank you so much for your time in writing this post.